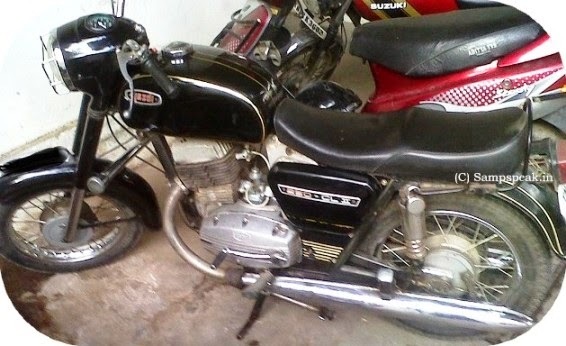 In 1970s, only very few owned motorcycles – some found on road were Enfield Bullet, Jawa (Yezdi) and Rajdoot. There was a key which had to be inserted to keep the vehicle on, before one kick-starts – the ignition key was primarily a metal protruding out of plastic ... in fact mechanics would start the vehicle by simple inserting a cable wire in the ignition hole. Powered by either a magneto or battery, sparks would get supplied and vehicle would power its way. Away in Europe, there is news that there is spurt in car hacking .... not normal thefts – but theft of high-end vehicles which have ‘keyless’ ignition systems – victims being owners of high end BMWs, Range Rovers, Audis and the like. As one would know, these do not have traditional ignition key, but come with a plastic fob containing a computer chip and security code. When the fob is placed in a slot on the dashboard, the code is detected by the car’s central computer, allowing the driver to start the engine at the press of a button. In some models, you don’t even have to put the fob into the dashboard slot: simply having it in your pocket or handbag will do the trick. Keyless cars are supposed to be convenient and more secure. By some accounts - for lowly values, car thieves can buy a blank key fob and a hand-held box that plugs into the ‘on-board diagnostic port’ — a socket linked to the computer which is usually found next to the passenger side footwell. The hand-held box tells the computer to reprogramme the blank fob with a new code. It takes only a few seconds to create a fob that can be used in the car again and again. These boxes are available on the internet and were designed so that garages and locksmiths could create replacement fobs for owners whose own sets had been lost or stolen. So, they are also easily available to thieves.Thieves still have to get inside the cars, of course. Some do it the old-fashioned way by smashing a window. Others lurk close to a car as it parks and use a radio-scrambling device — again, easily bought on the internet — to stop the car locking when a driver presses the remote control button. The risk was highlighted by so-called ‘ethical hackers’ — engineers looking for technical weaknesses — who breached security systems by a similar route, to warn manufacturers and the public about the dangers. Back home, here is something circulated to my group through e-mail way back on 5th Mar 2009. This is no news for Chennaites as this appeared in almost all newspapers of date but for others could make an interesting read. Theft is defined under Sec 378 of IPC as “Whoever intending to take dishonestly any moveable property out of the possession of any person without that person's consent, moves that property in order to such taking, is said to commit theft. “ and IPC prescribes punishment with imprisonment for a term which may extend to three years or fine or with both. Going by olden description, thieves used to live outside were considered outcasts, would generally look ugly and would perpetrate crimes. The field of criminology describes crime committed by person of respectability and social status as a ‘white collar crime’. The following would qualify straight for a movie – a software professional going to work on his new bought Honda City, goes to Office parks and little later vehicle whirrs past the parking lot – Police traces the vehicle within hours using technology as never before. The car belonging to a General Manager of HCL was stolen from high security premises in Kandanchavadi, outskirts of Chennai. Police arrested a Central Govt Employee (Accountant General) housed at Teynampet (heart of Chennai) with vehicle being parked inside the Govt. office premises. The DCP told the Press that they saw grabs of closed circuit television on the HCL campus and traced the car with the help of mobile telephony provider by virtue of a mobile accidentally left in the car. The car owner had taken delivery from a leading showroom in Anna salai – the Show room could not locate the original key at the time of delivery and arranged a master key. When the proud owner came down to display his new car, it was not there. With the tracking of cell phone, the location of the tower which was picking the signals was tracked and the Police scanned all parking bays within that quarter. Upon seeing the police in pursuit, the office goer thief threw the key in the office toilet but the Police had their way. The apparently unlikely car lifter Andrew Rajkumar lived in a residential locality – his neighbours , colleagues and his wife, a school teacher were all aghast and startled. He confessed that he used a fake identity card to enter the HCL campus and drove away the car. Auto locksmiths are the ones to call if you lose your keys or the key breaks in the ignition slot. These individuals provide you replacement keys on the spot, transponder chip key coding, extract broken keys, and create or install new keys as well. Forensic locksmiths are a bit trickier to find. They normally work alongside investigative agencies. If you feel that you need their services, it is best to talk things over with a police officer or an insurance investigator. If your home has been burglarized, calling a residential locksmith service denver CO is also a good choice. They can provide you immediate services such as changing or repairing the locks to your home. Almost all commercial locksmiths have websites that are complete with a number and information regarding the various services they are capable of providing. If you are considering installing or upgrading a security system, most commercial locksmiths provide you quotes and recommendations on the best type of security system to set up. You can trust their opinions because these individuals are trained and skilled professionals and they are kept up to date with the latest security systems in the market.